Josh, Lauren and Chloe are all getting ready for Bath Time and then it will be time for bottles and off to bed. Chloe is the biggest of the 3 babies by about 2 pounds. Her favorite activity is to bounce in the Johnny-Jump-Up. Josh gets around pretty good in the walker. Sometimes he goes better backward than forward. Lauren is trying to catch Chloe by eating good, but it's not working. She's the most active, rolling, moving and playing. Did we mention how patriotic we are? Chloe and Josh don't mind making sure you know! Chloe is ready for a swim! Josh says, "Don't mess around with a guy in shades." Lauren cuddles up to Grandma. That makes everything all better! Chloe shows off her pretty outfit. Mommy sure does dress these little guys in the cutest things. Anybody up for a bath? Josh is enjoying his! 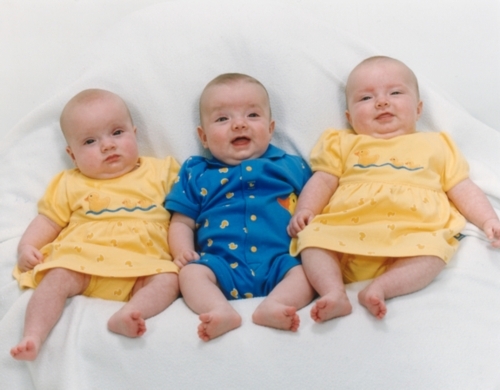 Lauren, Josh and Chloe wearing their duck outfits and looking twice as adorable as three little duckies.